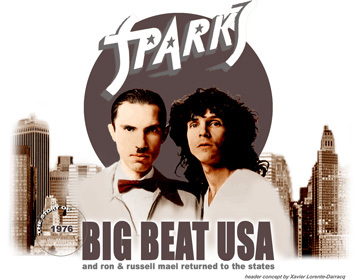 The Sparks' "Big Beat" Lp was recorded at Mediasound Recording studio in New York City during August 1976. 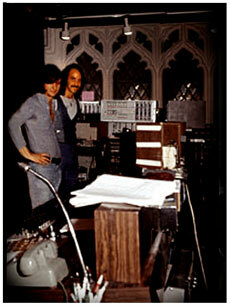 In the '70s Mediasound was regarded by many artists as the place to make the best-sounding records in the business. Nicknamed "The Church", the studio had been founded in 1969 by John Roberts and Joel Rosenman, two of the promoters of the original Woodstock Festival, and it was located at 311 West 57th St. between Eighth and Ninth Avenues, in the heart of Manhattan. Built as a Baptist Church in 1930, the building housed Mediasound through the 1970s and '80s. The studio was architecturally flamboyant and was massive - 16,000 square feet of space and four state-of-the-art 24-track recording studios - it was the talk of New York and the scene of many hit sessions : Duke Ellington, Frank Sinatra, Quincy Jones, The Rolling Stones, David Bowie, Kiss, Kool and the Gang, The Ramones... In 1976 the hourly rate was $170. During recording sessions Ron Mael & Russell Mael were shouldered by Tuff Darts guitarist Jeff Salen, Milk'n'Cookies bassist Sal Maida and session drummer Hilly "Boy" Michaels. The Sparks' "Big Beat" album was produced by Rupert Holmes and Jeffrey Lesser as Bob Clearmountain, Harvey Goldberg & Michael Barbiero were additional engineers. 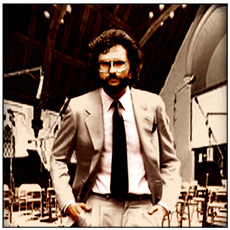 Opting for a more guitar/bass/drums-oriented production Rupert Holmes & Jeffrey Lesser attempted to create a real big sound for the Sparks' album and Mediasound studio certainly had a sound that no one else had; the recording room was ideal for noisy rock'n'roll. Having had a previous incarnation as a church the live room was really big and the ceiling was heavenly high so engineers put the overhead stereo pair for the drums exactly 18 1/2 inches above Hilly Michaels' kit, for the most breathtaking room sound. However, the one large space had sub-rooms to the back and sides in order to achieve total isolation for Ron Mael's acoustic piano and Sal Maida & Jeffrey Salen's amps. But while separation was always an issue with recording engineers, the sound of the 'bleed' was really kinda neat, and the room's natural reverberation was beautiful. Engineer Bob Clearmountain was able to get great bass sounds, especially from Studio A. Bob Clearmountain : "Working at Mediasound as additional engineer, I learned about the importance of bass, drums and feel in the rhythm track, and I applied the things I learned about Rhythm n' Blues to making rock records (as "Big Beat")"
Although he wrote the songs as usual, keyboardist Ron Mael was pretty much either buried in the mix throughout or just not doing very much interesting the entire album. At time Ron Mael had abandoned his RMI Electra-piano for a grand piano on the album (and did the same on the tour which followed) and kept his music-hall tendencies in the background, leaving most of the performing space for Tuff Darts guitarist Jeffrey Salen, who skillfully brought a new edge to the songs. The "Big Beat" Lp opened with "Big Boy". This song was chosen to feature on the only single from the album which sank without trace the moment it was released and "Big Boy" never reached any Billboard chart. The flip side of this single was the propulsive "Fill-er-Up", one of the first Sparks songs in which lyrics were subordinate to music, the verses functioning only as spaces between the searing solos. Three years before The Maels had planned to record one of their old songs called "I Like Girls". They played it during rehearsals with bassist Martin Gordon and it was recorded during sessions produced by John Porter. However the song didn't appear on "Kimono My House". Producer Rupert Holmes re-arranged it incorporating a mighty horn section and "I Like Girls" finally found its place on the "Big Beat" album. Russell Mael : "The song was written at the time of the original L.A. band. On retourning to America, after our 1972 European tour, we jetted to Bearsville studios in upstate New York (Woodstock) to record the stage favourite "I Like Girls". Nick James produced the song but it didn't come as well as expected. At time "I Like Girls" was due to be a single but was never released and it never saw the light of day until the Rupert Holmes production version on Big Beat." Sparks "I Want To Hold Your Hand"
"Everybody's Stupid", "White Women" which sounded most like older Sparks, and "Thrown Her Away (And Get a New One)" suggest, the album brimed with decidedly politically incorrect and hilarious lyrics and The track "I Bought the Mississippi River", a heavy guitar/bass driven tune about buying a river and shipping it back home, still remains one of the best Sparks' song ever. Even though "Big Beat" was going to be a more stripped down album with more guitars and fewer of Ron's keyboards Russell Mael was going to do a lush, orchestral duet version of Lennonn & MacCartney's "I Want To Hold Your Hand" with Marianne Faithfull. Producer Rupert Holmes did syrupy score for the song, yet Marianne Faithfull dropped out of the project at the last minute leaving Rupert Holmes, Jeffrey Lesser and The Maels with a score and no one to sing it. Russell Mael ended up singing the song, yet it seemed so incongruous even for Sparks, that this execrable orchestral assault produced by Jeffrey Lesser never appeared on an album. At time Ron & Russell Mael had also worked together with their previous bandmate producer/guitarist Earle Mankey co-producing "England", one of the weird song ever recorded by The Maels. 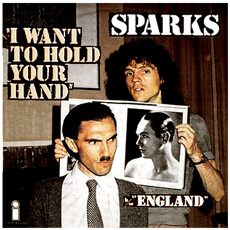 A single of "I Want To Hold Your Hand" b/w "England" was released as Sparks' in a few assorted European lands. This vinyl single is rather scarce nowadays but both of the songs are now available on Sparks' "Indiscreet" Cd reissue as bonus-tracks. Mediasound Recording studio ceased functioning in 1989. The place became the trendy "Le Bar Bat", and over-sized steel bats were hung from the ceilings; gold records, album covers and signed celebrity photographs were hung throughout the bar. Today the site is occupied by restaurant Providence, where you can still see the Gold Records on the wall.